Several people have been killed by extreme weather conditions in Europe, including a 44-year-old man in the German town of Wackersberg in Bavaria and a young woman on the Teisenberg in the Berchtesgaden region. In western Austria, five people were killed over the weekend. Norwegian officials said that four people, including a Swedish woman and three Finnish skiers, were killed by an avalanche. With meteorologists still expecting inclement weather throughout the week, Dutch airline KLM announced it had canceled at least 159 European flights to and from Amsterdam due to the conditions. 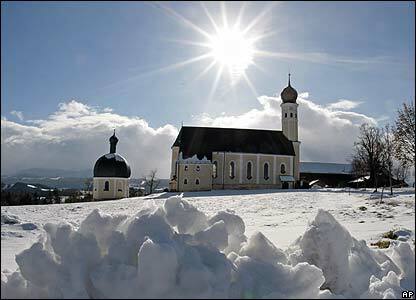 Meteorologists at the German Weather Service (DWD) expected up to 20 centimeters (8 inches) of snow in the Berchtesgaden district in southeast Bavaria on Monday and up to 40 centimeters in parts of the Alps and Alpine foothills. The service also warned of avalanches and snow damage, for instance from falling branches. The region has been hit with 60 centimeters of snow, according to the DWD, though it says the flurry could ease up temporarily on Monday afternoon. Several Bavarian school districts have canceled classes on Monday because of the conditions.